We all have to buy clothes eventually, but truth be told, not everyone likes having to try them on. So wouldn’t it be wonderful if we didn’t actually have to? That’s the customer-end of the promise made by virtual fitting rooms with augmented reality, popping up in more and more stores around the world (including the iconic Galeries Lafayette in Paris, as shown below). From the retailer side, virtual fitting rooms have clear benefits. Obviously, their ease of use will attract more people in stores, and it will probably still be several years before their novelty factor starts to wear off. But on top of that, virtual fitting rooms can help stores lower their inventory, which is a genuine game-changer for the retail business. Brick and mortar stores no longer need to carry clothes in all sizes, colors and patterns; customers can simply “try on” the demo (virtually of course), customize their pick (say, Medium in Light Blue with contrasting trim) and place their order. They will then receive the merchandise at home. This can prove to be crucial for small independent shops or ones located in areas where square footage is at a very high premium. The future of retail fashion? Technologies like virtual fitting rooms could very much reinvent retail stores in the coming years, says IDC Retail Insights research director Ivano Ortis. “Stores will not disappear, instead they will become a place for brand/consumer experience and new technologies. Bringing online capabilities inside the store is a transformation in retail, and it is bringing better opportunities and driving sales,” he explained about the increasingly fragile industry. As online shopping becomes more and more prevalent, virtual fitting rooms could bring a value-added experience and bridge the two paradigms: visiting a store to find the wanted/needed item, then purchasing it from the store’s online platform and having it shipped. 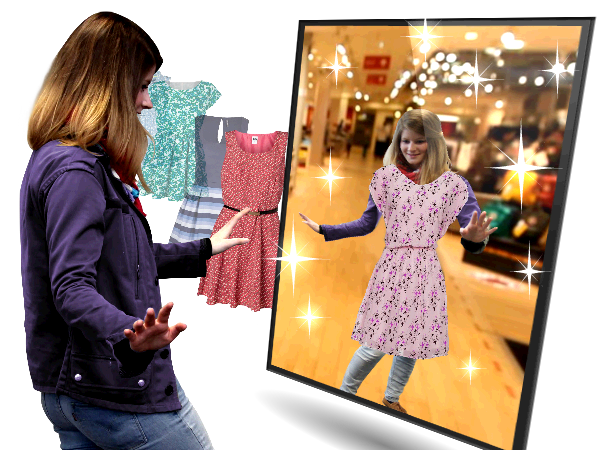 Virtual fitting rooms with augmented reality have been around for about 10 years, first starting with 2D technology. But how do the latest augmented reality virtual fitting rooms work? 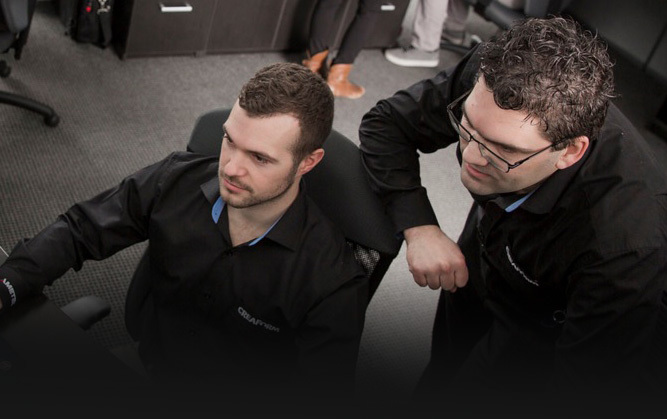 They superimpose the 3D model of a clothing item to the live video feed of the customer. The clothing item can even move with “wearers”, turn and twirl with them. Even if not perfect, the effect is pretty impressive for an up-to-the-minute virtual experience! While available software is currently advanced enough to understand and even “feel” the way a clothing item will fall on a given person’s body, the most realistic experience will always be a personalized one. 3D body scanning could become a strong partner in this industry, because it can create avatars that take virtual clothes shopping to a whole new level. Imagine virtually trying on clothes that fall on your body exactly. 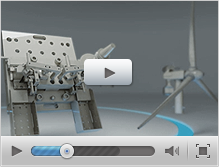 In this specific application, 3D body scan can bring an unparalleled level of realism and precision. 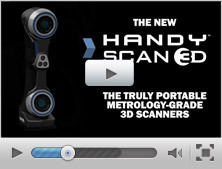 While the organic shape of the human form may seem complex to digitize, the Go!SCAN 3D scanner makes the task extremely quick, simple and completely non-invasive, creating a perfect 3D model of the customer. And with this, clothes that fit perfectly don’t even have to be tried on anymore… Not to mention avatars created with 3D scanning could further solve numerous sizing issues, as well as minimize merchandise returns.